How to Play AVI Files on Xbox 360? There are lots of such question asked online. AVI(Audio Video Interleave) file is a multimedia file or container used to store video and audio information with different codec. Nowadays, AVI is still the most commonly traded file type in the world. Actually, Xbox 360 multimedia have been upgraded to support for AVI files in 2007. However, a great many people complained to run into problems as above mentioned, they are prompted with the error message “Can’t play this content because it may not be supported”. Why? It turns out that only when the AVI files meet the following requirements can they be smoothly played on Xbox 360: Xbox is connected to Xbox Live and an optional free video codec pack is downloaded. It sounds complex, right? The answer is 100% yes! Don’t fret, this post will elaborate information on X360 as cleverly as possible and detailed steps on how to play AVI files on Xbox 360. Xbox 360 is a gaming brand developed by Microsoft for home enjoyment. It includes video game consoles of Xbox, Xbox 360, Xbox One, Xbox 360, etc. Users will have excellent experience with the outstanding visual features and gaming capability of Xbox 360. In recent years, Microsoft has updated Xbox 360 regularly to cope with the development of gaming. What is Leawo Video Converter? Leawo Video Converter plays an important role on converting AVI to WMV, MP4, M4V and other Xbox 360 supported video formats. This professional video converter contributes a lot to convert videos of up to 1080P between 180+ video formats, such as AVI, MP4, MOV, MP3, AAC, FLAC, etc. In addition to video format conversion, this tool is also capable of converting 2D to 3D to create 3D movies for fantastic feeling. With the help of this program, you’ll be able to set parameter of videos, add external subtitles to video, choose audio track and language as you like, etc. Afer getting information of Leawo Video Converter, you can turn to follow the guide below. Now let’s download and install Leawo Converter first on your computer. Mac users cna turn to Leawo Video Converter for Mac. 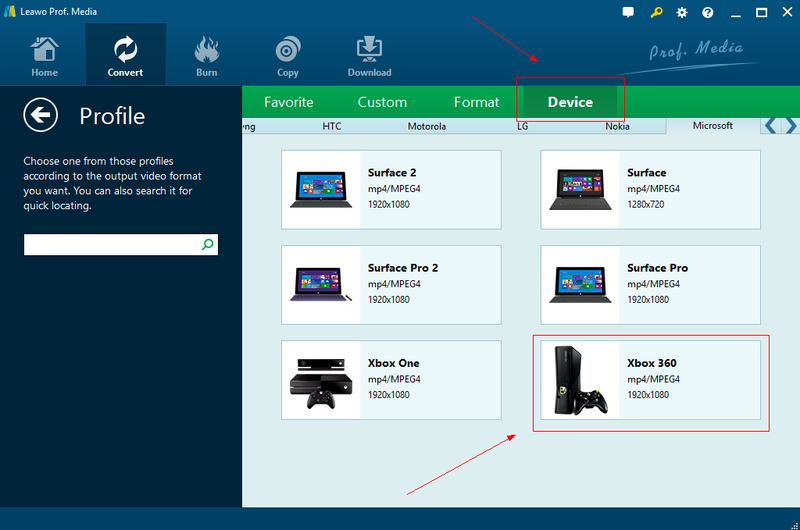 Guide on How to Convert AVI to Xbox 360 Compatible Format with Leawo Video Converter. Open up the main interface of Leawo Video Converter, click “Add Files” load selected AVI video files or directly drag files to the Convert page. If you think it a waste of time, you are also allowed to click Video folder to import a folder of video files at one time. Click the drop-down box next to the “Add Photo” button and choose “Change” from the drop-down list. And choose “Device > Microsoft > Xbox360″. Or you can also select WMV, MP4 or other Xbox 360 supported file formats as output file. If necessary, you could also click “Edit” button to modify file parameters, like codec, aspect ratio, frame rate, resolution, audio codec, bit rate, channel, sample rate, etc. After setting file parameters, set output directory and click green “Convert” button next to the format setting drop-down box to start file format conversion process. After the whole process, you will find what you want from the output file, then you can play this target video on Xbox 360 via streaming or the help of a USB storage. That’s it ! So far, you may have had a good knowledge of AVI, Xbox and how to play AVI on Xbox 360 with the help of a powerful tool: Leawo Video Converter. You just need to convert AVI to the Xbox 360 compatible formats, such as WMV and MP4 with several steps. Indeed, there are many such converters. However, I prefer Leawo Video Converter since its powerful functions, well-designed interface and easy-manipulative, etc.